Under the Occupational Health and Safety Act of 1983, employers have a "duty of care" to ensure the health, safety and welfare at work of employees and others. There is no excuse for not wearing a hard hat on a job where one is required and failure to comply with the "duty of care" is an offense. Hard hats should be worn at any job where flying objects, harmful contacts or exposure to electrical shock may be a danger. There are many ways head injuries can occur such as objects or tools falling on workers below, falling tree limbs and objects hanging or dropping from overhead cranes. Chemistry and manufacturing have turned out head protection to fit every need and just about every taste in style. The colors are attractive and the hats are designed for comfort. A hard hat consists of a hard shell that deflects blows. A suspension system covers the inside of the hard hat and absorbs shock from a direct hit. Shields may be added to provide protection from spills, splashes and drips. Other additions are goggles, hoods and hearing protection. Hard hats should be cared for properly. Checking the suspension system to ensure it is not cracking, tearing or fraying is important. If the cushion does not fit well, it should be replaced. A hard hat should be kept clean and sanitized. Washing a hard hat can be done by submersing it in hot water about 140 degrees Fahrenheit with an anti-bacterial detergent. Proper training is important with the use of hard hats. Employers and employees should know the types of hard hats required and limitations of each. Hard hats should be job-specific and meet the protection requirements. Each person who wears a hard hat should be trained on the use and care of hard hats, including how to identify signs of wear and how to property clean a hard hat. Employees should avoid adding stickers or painting over the original color of a hard hat. Industrial Safety Gear: Why Use Head Protection? Maddox, Amanda. "Hard Hat Safety Information." 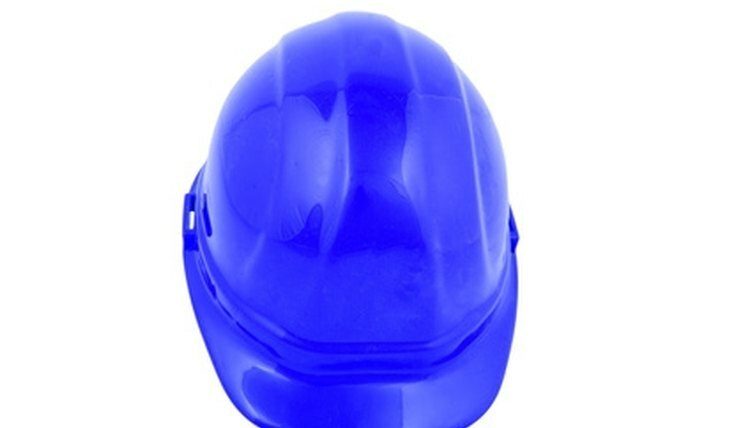 , https://legalbeagle.com/6383715-hard-hat-safety-information.html. Accessed 20 April 2019.